Of course, its Valentine’s Day. And, we all think of Eros – red hearts, flowers, chocolate! Is there someone who needs your Agape? Maybe someone who is caring for another. Maybe someone who is lonely. Or an old friend who you’ve lost touch with. We never know what change is coming at us. Two months after my last post, Hurricane Matthew looked like he was going to grind up the entire Florida coast as a Cat 4. I dashed away from my out-of-town gig to rush home and evacuate my parents. Two hours into my five hour drive south I got a call from my boss saying, sorry, but we’re going to have to replace you immediately. We’ll get you back in here ASAP once your family responsibilities are complete. I said, OK, no problem. This is life as a storm adjuster who also lives in a hurricane prone state. Can’t be everywhere at once. One hour later – still rushing south – phone rings again. Different company asking me if I am available to lead an in-office storm team – right in my own home town! Oh, yes! How’s that for timing? Maybe God is in control? That gig didn’t last long but segued into another also in my home town. Whew. Good thing too because by then I needed to attend all parental medical appointments, etc. Working out of town is no longer an option. Woot!!! Woot!!! World’s Biggest Woot! The hours were brutal but completely flexible – allowing me to work as much as 77 hours/week while still getting my parents to appointments and walking their new dog. (Hah, that’s another post). But, after ten months of that pace, I’d had enough. I took the slower summer season as the chance to change my Day Job. We’d been praying that this opportunity would come and it did. Same industry, different role. Still work from home. Still completely flexible hours – just a lot less of them and less emotionally draining. I LOVE my Day Job! It’s been two+ years of hard work and sudden changes. I am thankful for the grace of God which continues to strengthen me for each step and allows me to face the future with peace – having seen His hand so clearly at work in the past. 2019 is going to be challenging in endless ways but when I can make myself stop and remember His past blessings, I can face the next round of the whirlwind. The best remedy for surviving a twelve-hour day in cubicle-land is to spend my early mornings on my own goals. I have posted on LDavisCarpenter about the challenges of writing historical fiction and am starting a Flash Memoir side-project while chipping away at my novel. I am reasonably confident in my non-fiction abilities but creative writing is – whew. I know how long it takes to develop any new skill so I want to use my life experiences as material for word-crafting practice – before I am faced with final edits of my long fiction. Flash Memoir seems like a good choice for distilling memories into words that transport a reader to another’s time, place, thoughts and senses. I also think it will be fun to capture snippets of my own crazy life in this form. Meanwhile, you can see last summer’s mural on the Marsh Hawk Studio blog. I still plan to do a process post showing the steps to creating it but those pictures are on my other laptop which an Office update recently corrupted and can no longer access the internet. (Yes, thank you very much.) I will soon update the Long Ago & Far Away blog with notes on Conn Iggulden’s Genghis Khan series. If I can ever get my blogs up to date AND have a day off – I’ll be back to writing my novel. ***About Mr. Grackle – just a fellow at my feeder on a snowy morning back in VA. Those eyes look like I feel most mornings before tea. There’s a certain martyr’s pride we risk when forcing ourselves out of bed in the wee hours to get our writing done. I’m back to the Day Job – the traffic, the hours (the paycheck! old friends! new friends!) Thankfully, this time I have a shorter commute which is allowing me to find a few minutes in the morning to think about writing. So far I’ve managed to read some research material and scribble a couple of posts on my writing blog. I could get up even earlier but, working six or seven long days every week, less sleep would reduce my ability to help the people who depend on me at the office. They depend on me for training in order to stay in their assignments as long as possible. But, my sense of responsibility goes beyond their urgent questions. My employer depends on me to keep our people in their roles because that’s the core of our business. Our client depends on our people to serve their customers well, in support of their brand. Those customers depend on our people to be professional and accurate during their time of need and sometimes great stress. And, my people have others in their lives depending on them to bring home a paycheck. I owe them all seven hours of sleep every night. My studio has returned to chaos. 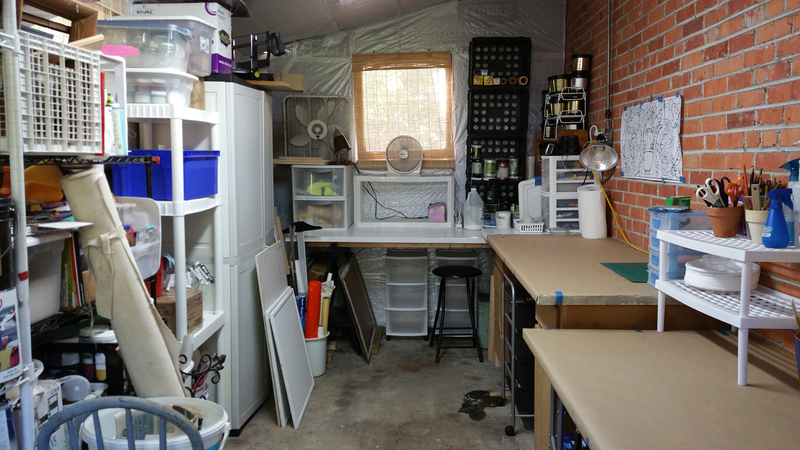 You can see the results of the Studio 3.0 Mural Commission posted on my Marsh Hawk Studio site. As I mentioned there, once I completed that project, I was immediately out of town to work as a trainer/manager of independent insurance adjusters in Atlanta, GA. After six months, I returned home to move my parents from their rental to the finally ready “new” home. We’ve been working long days, every day to get them moved in. We’ve also changed every one of their doctors and dentists in this last 3 months. I hope to never see another “New Patient” form. But, how about a few detail shots of our hard work? Two weeks after closing, we received a notice from the city that our neighbor had complained about it dropping limbs into her yard. $6500.00 later, the tree and the liability hazard deck were gone. The house had no laundry room. So we added that plus a mud room in the area of the old deck, then added the stoop. Pardon the ladders. Work yet to do. Along the way, the house was gutted and essentially rebuilt from the inside out. New wiring, plumbing, everything. When they started to tear out the interior plaster on the exterior walls, they discovered there was no lath, just plaster on terra cotta block walls. So, they left the plaster and stick built from the inside in order add insulation. Add new roof, new windows and attic insulation and the folks are now snug. The ceilings throughout had been dropped. The new ones have been returned to their original 9’6″. Living room with dropped ceilings. Same wall with ceilings restored to original height. Showing the exposed upper glass block and the display of Mom’s favorite writers around the door to her writing room. Raising the ceiling in the living room exposed the top row of glass block at the entry. Their exterior had been painted gray. Now they sparkle inside and out. The exterior still needs some wood rot replaced and paint. But my parents are now ensconced, mostly unpacked and starting to get on with living. Now for me: I’ve made myself available for work adjusting again but I may have to wait for tropical storm season to spool up before I can return. That makes me financially broke but anxious to use these slivers of free time to update my blogs and drag out my historical fiction project. In the midst of my personal madness, I got an email requesting a small-ish mural. As it happens, I think I can actually squeeze one in between the time I get the parents physically deposited here in Florida and when I will make myself available for adjusting work again. There is going to be a phase of getting the folks settled – finding doctors, learning the roads, etc. when I don’t want to be in a 12hrs x 7days work gig. A mural could be just the right diversion. 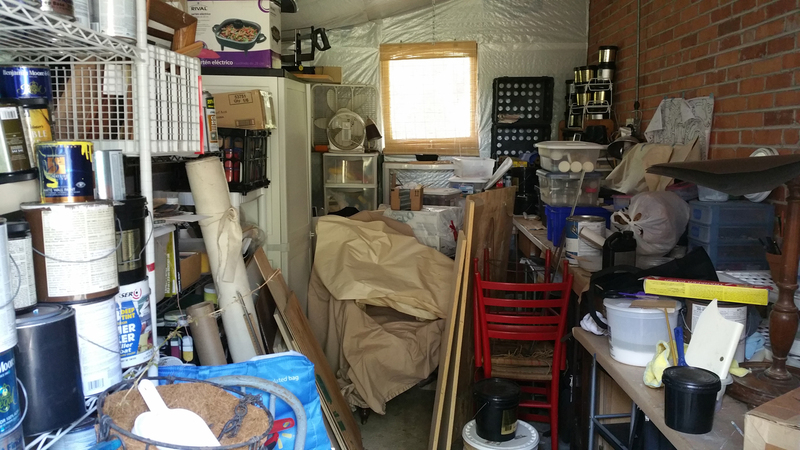 However, in the last 18 months, my studio has turned into a warehouse. So, the first task was to clear it out and sweep up the leaves that blow under the door. All better – the black splodge on the floor is a permanent spill of some mystery substance from before my time. Client meeting went well. Proposal completed and passed. Next step is a detailed drawing. Meanwhile, I drive to Virginia tomorrow to start the final phase of loading the folks’ furniture in containers, deep cleaning the house in preparation for the market and getting them and Sally-dog into the car. Of course, it’s going to be in the 100s in Florida and the 90s in Virginia this week. All good fun. I’m south again and was hoping to start painting my parents’ new interior, but the drywallers aren’t finished yet. So, faced with a glorious day, I decided to complete a little project of my own. My husband built this storage barn last summer. For security reasons, we didn’t want windows, but we also didn’t want to be looking at bare-faced siding. So we planned some faux windows. Hubster framed them with Hardie board; my job was to complete the illusion. Start to finish took about two hours – including clean-up and a fresh coat of paint on my back steps. Mind you, it could still do with a bit of shadowing and the paint bled under the tape because of the surface texture. But it does the trick “at 40 feet on a galloping horse” as we used to say in the theatre. It was good to be on a ladder with a paintbrush in my hand again. Been too long. But I’ve got a whole house to deal with once that drywall is in and straight painting isn’t my favorite. The decorative stuff is much more fun. I think I should paint the door the same color as the siding. What do you think?